During our +40 days field studies across East Africa, EGF team members stayed in full immersion with local families & orphanages. From the slums of Kibera to the rural areas of Nukuru, Kakamega, Kitale, Ruiru, Thika and Kambi, we were warmly welcomed to lovely evening conversations, a bed & a meal each day. We are listening & learning so much more from experiencing the context in which our entrepreneurs operate their social businesses. 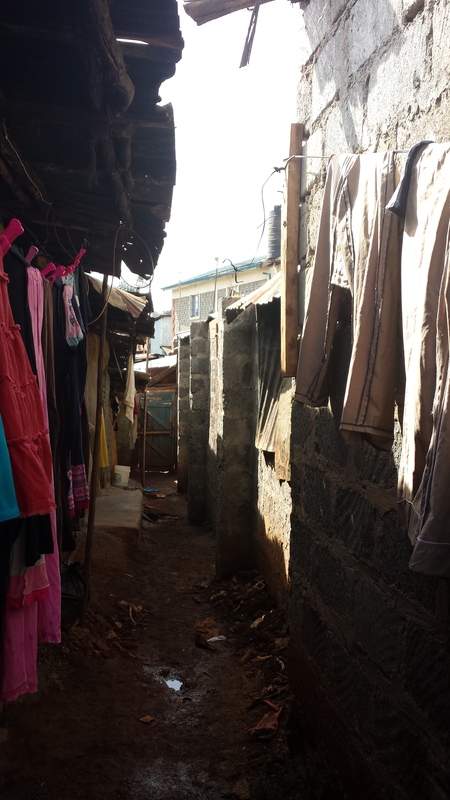 We would like to share our experiences staying with local families & orphanages via a series of short articles in our blog: Series 4: Paradise Community Centre, Kibera Paradise Community Centre is situated in Kibera, the largest slum in Africa. 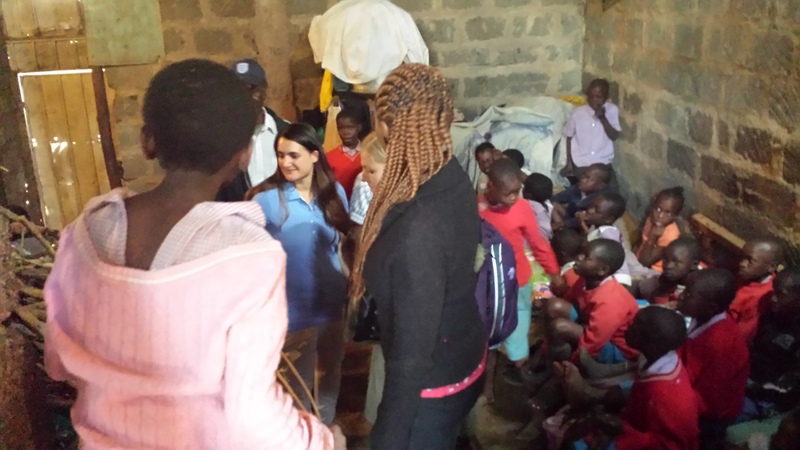 Pamela Owino takes in abandoned children from the local community, providing them with a home, clothing, food, affection and a primary education. She currently cares for 35 children, and has supported over 100 to date. Pamela began taking children into her home after a particular incident in 2002. At midnight, neighbours knocked on her door looking for a home for two small boys. Their father had just died of AIDs, and their mother, beside herself with grief could not bear to look at her children. Her late husband had infected her with HIV, and as the children were his blood, she no longer wanted them, and threatened to kill them. Pamela ended up taking them in. As word spread, the community began to ask if Pamela could save other orphans from life on the streets. Pamela and her husband decided to start taking in more children, but after five years Pamela’s husband gave her a choice – him or the kids. Unable to abandon the children she had promised to care for, Pamela decided to continue supporting the children alone. Pamela has overcome huge challenges in her fight to support these children. In 2012 her home collapsed due to heavy rains, leaving her and 30 children homeless. The UNDP helped to rebuild the house. Paradise does not have any regular donors at present and is reliant on well-wishers and supporters in the local community and abroad. Pamela aims to support the children to complete primary school, but sometimes lacks money for fees and ends up in arrears to local schools. 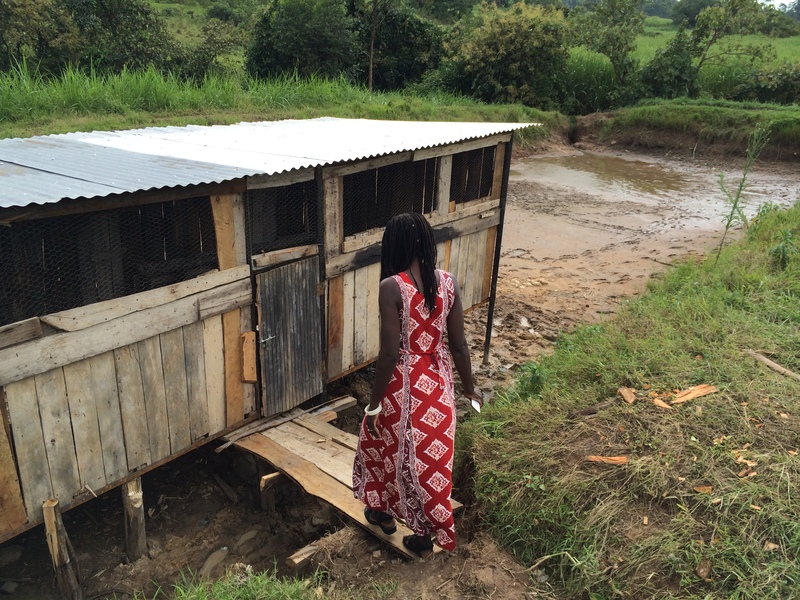 Despite these difficulties, Pamela continues to dream of providing a home for more children. Her vision is to build a 4 storey house with dormitories, and office and a school. She wants to be able to care for hundreds of children from the local community instead of just a few dozen. If you would like to support the work of Pamela, please contact info@educateglobalfund.com. There is a saying in Africa that if you educate a man you educate an individual, but if you educate a woman you educate a family. Despite the growing awareness, girls in Africa still often face higher barriers to education opportunities. AfricAid, which I visited recently as part of EGF‘s field trip, was founded with the goal of supporting girls’ education in Africa in order to provide young women with the opportunity to transform the lives of their own and the future of their communities. It operates various projects in Tanzania, amongst which the Kisa (meaning stories in Swahili) leadership programme for high-school girls. There are still beliefs in Tanzania that girls do not need to be educated beyond primary school levels whereas boys are encouraged to continue learning up until university. Early marriages, pregnancy and dropouts amongst girls are still a prominent issue. A girl in Tanzania starts in the family speaking either Maasai or Swahili, then goes to primary school where she will be taught in Swahili for 7 years. In the transition from primary to secondary school typically by the age of 14 years, girls need to pass the Form 2 examination, which is given in the English language. To get into high school, girls need to pass another test in English called Form 4. There’s often a lack of resources for students to learn English proficiently to pass the exams. Many times, their teachers do not speak English themselves and teach from textbooks directly. Students rely on rote learning because exam answers are marked on the basis of “word for word” repetition. Girls who manage to complete high-school face their last hurdle to university: passing Form 6 exams and here’s what the Kisa project is about: supporting girls in the transition from high-school to university and helping these academically outstanding girls who come from poor families all over the country to become the future leaders of Tanzania. 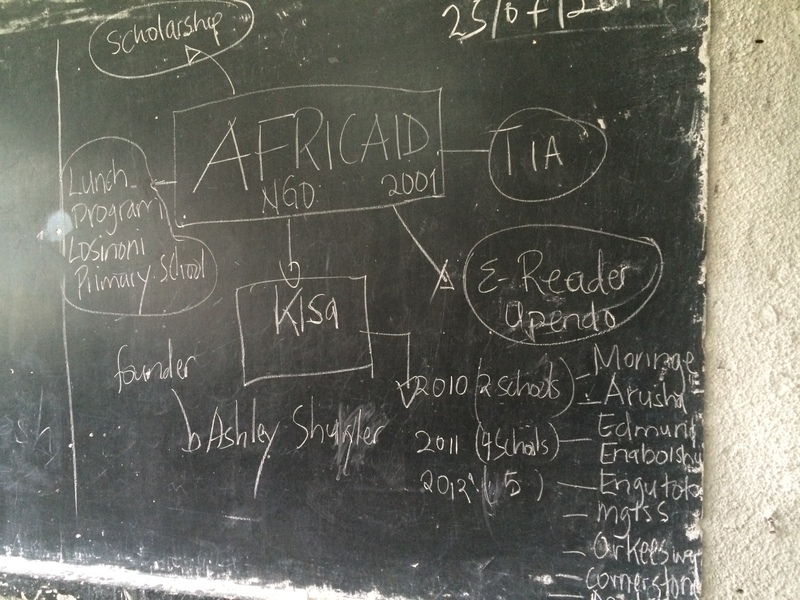 In their first year, Kisa girls work on developing a plan for a community project of their choice. At the end of the year, they give a presentation to the school and their communities. In the second year, girls implement their community projects whilst still benefiting from life skills as well as sexual and reproductive education within the Kisa programme. 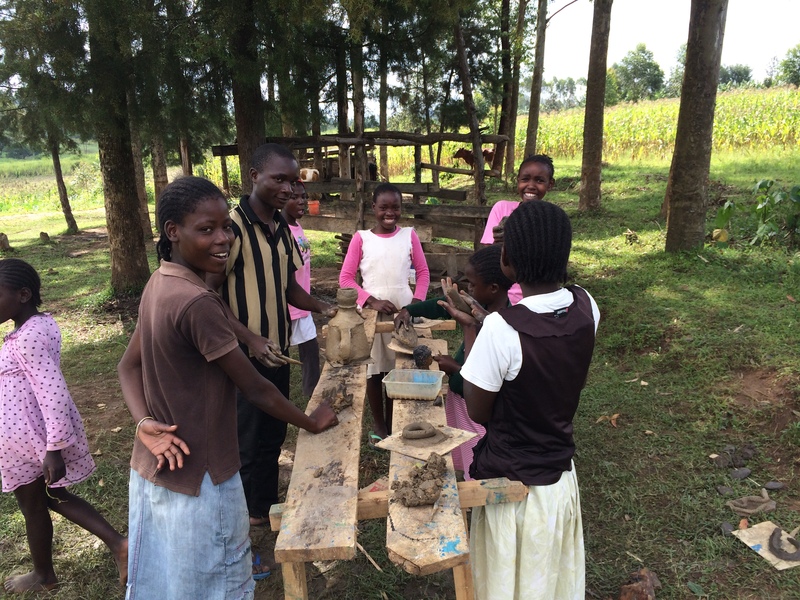 Our Kisa girls learn about confidence, resilience, leadership skills and never give up! I had dinner with one of the Kisa students, Eliakunda Kaaya, who’s starting university this fall with the help from Kisa after having gone through so many hurdles to find support to pay for her school fees. 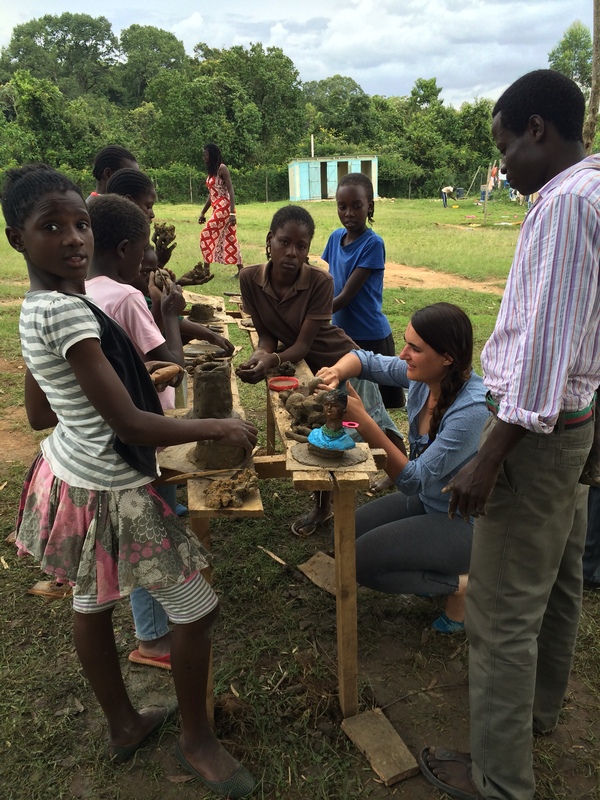 In 2015, the first inaugural cohort of Kisa Scholars will graduate from university. I cannot help but think Kisa should follow its alumni as they start their professional lives — and ensure girls do not give up on their pledges to be changemakers for the most disadvantaged. I shared my thoughts with the team at AfricAid to perhaps consider supporting volunteers-led city chapters of Kisa Leading Women across Tanzanian cities where Kisa alumni are employed or starting their own businesses. To support AfricAid and Kisa project, please click here. There are many other programs that are dedicated to improving education opportunities for girls in Africa. I visited Maasai Children Education orphanage in Arusha — a city in northern Tanzania – where Henry & his wife Dorice are taking care of 8 Maasai orphan girls as well as two children of their own. Every day I was simply amazed! Our Maasai girls from an early-age are taught to count, sing and read in English! They can speak Maasai, Swahili and English thanks to the home schooling, love and care. Henry & his wife’s dream is to build a school for Maasai children and orphans to expand their impact beyond the girls they were able to bring into their family. More initiatives are also developing in the Moshi area, where AfricAid just opened a new office to expand the reach of the Kisa programme and the team is excited about recruiting new Kisa scholars, hiring new mentors and establishing relationships with four schools (100 Kisa scholars) initially in Moshi. 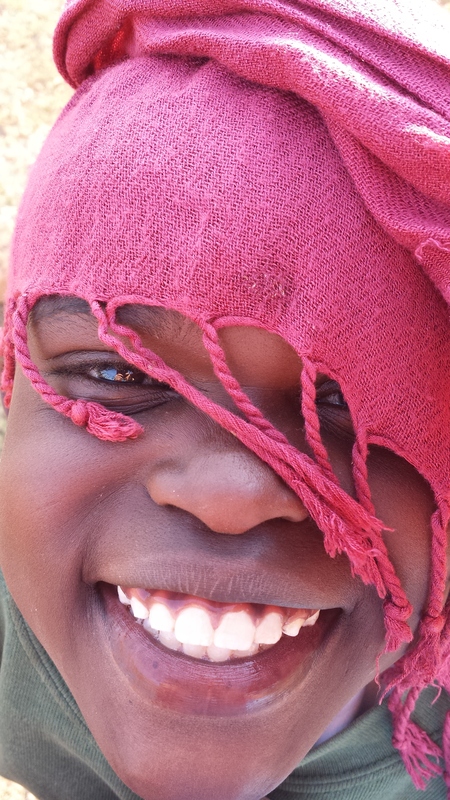 To support Maasai Children Education, please click here. 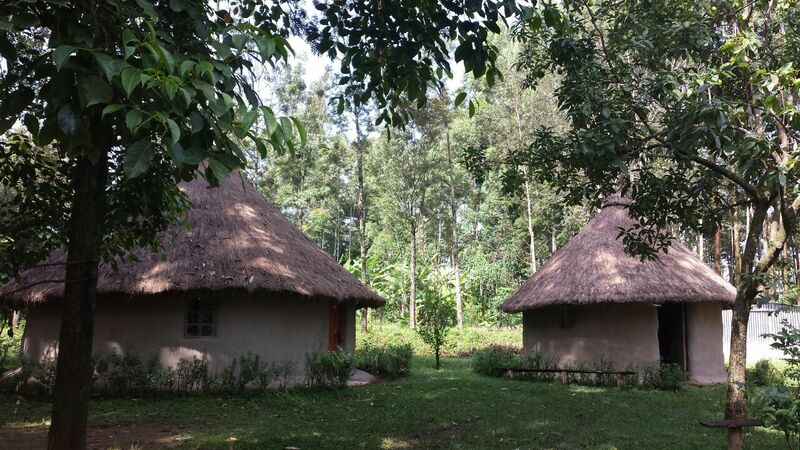 During our travels through Western Kenya, hidden away in the lush, green landscape of the Kakamega rainforest, the EGF team came across a little treasure in the form of Vumilia Children’s Home. Vumilia started life in 2004 as a women’s group with only a dozen members, counselling HIV positive women in the poor, rural community. This is an area where women are marginalised and the HIV/AIDS epidemic and domestic violence pose huge challenges. Vumilia sought to support these women and give them a voice in the local community. The group expanded and in 2005 a counselling and testing centre was founded, following by a feeding program for malnourished children. It became clear that due to high HIV/AIDS prevalence in the area, there were many orphaned children. Many of these girls were left homeless as their extended family did not want to take on one more mouth to feed, and girls have a lower status than boys. In 2006, Vumilia founded a girl’s home to provide care and education for these girls. 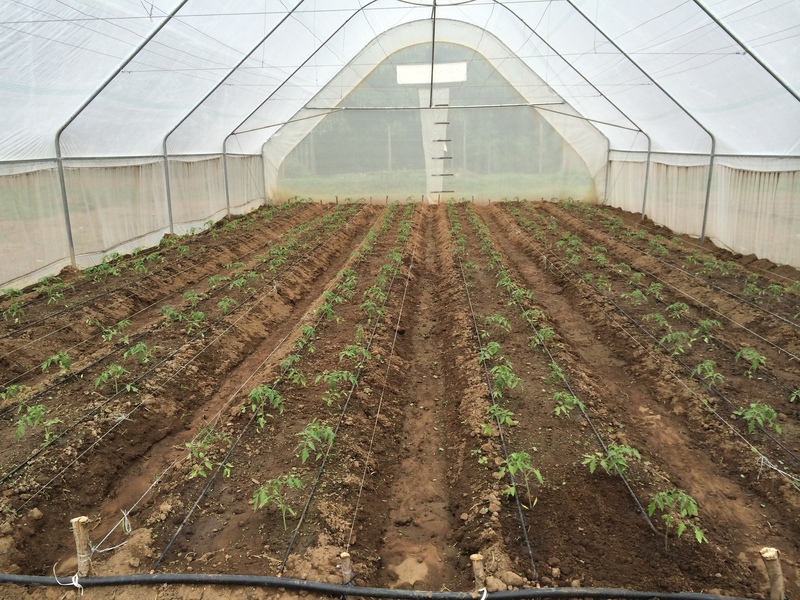 In 2010 a 6 acre farm was purchased in the area with help from donors. Dormitories were built and the existing girl’s home moved to this site. Since then a flourishing farm has been created on the site, including cows, chickens, fruit and vegetables, and a fish pond. The farm produce helps to feed the children, and excess is sold to the local community to help fund Vumilia. In 2012 Vumilia began a home schooling program for its children, hiring teachers to work with the girls instead of sending them to overcrowded local primary schools. The 27 girls at Vumilia receive a nutritious diet, good education, and learn important life skills through assisting on the farm or working with visiting craftsmen. The founder of the orphanage is a qualified counsellor and all the children receive extensive counselling to help them overcome their emotional issues and build their self-esteem. However at Vumilia these girls receive something even more precious than a healthy diet, or good education – they find a caring and loving home. Surrounded by green forest and farmland, Vumilia does not feel like an institution. From the windows of the two-storey house, girls can be seen playing in the gardens, milking the cows, lending a hand in the kitchen or taking part in a craft workshop in the shelter of some trees. They greet visitors with a press of the hand and a big smile, introducing themselves, whilst Mama Rose, the founder of the orphanage, gets a big hug. Rose Moon is the creator and driving force behind Vumilia, and a shining example of how it only takes one dedicated individual to transform the worlds of many people. Coming from a poor family herself, Rose didn’t get her first pair of shoes until she went to high school. She saw her parents fight to give their children a good education, which has lifted Rose and her siblings out of poverty to have a better life. 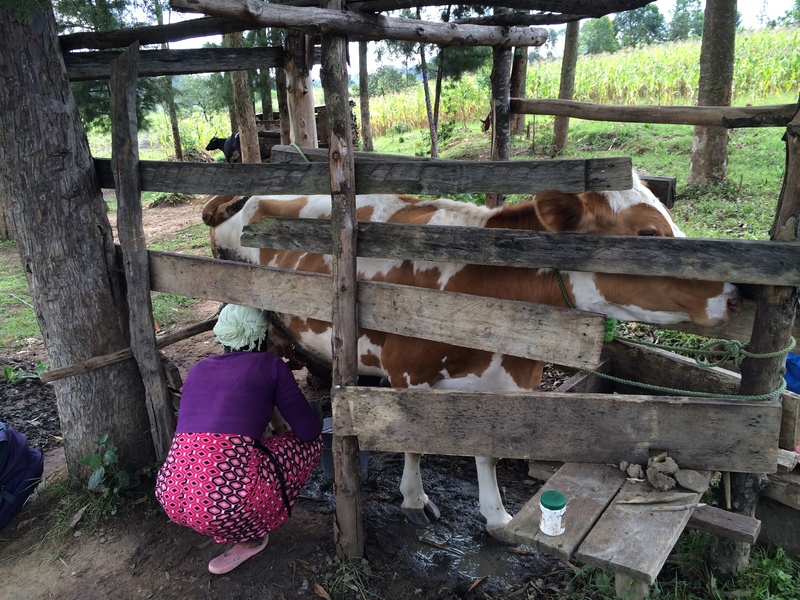 Rose now has a passion to educate others so they can free themselves from the poverty cycle. Rose would like to see Vumilia grow further to become a community-based organisation, home to 50 girls. She has a vision to build a series of huts on the site, each of which would be home to a ‘family’ – five girls and a house-mother, a widow employed from the local community. Each family would have their own cow and chickens and help farm the land, and the girls would be educated at the school on site. The Vumilia farm would feed these families and provide an income to make the entire project self-sustainable, not reliant on donor money. However, Vumilia has some obstacles to overcome before Rose can make this dream a reality. As a very small, grass-roots organisation, Vumilia is not currently being supported by any large donors or foreign partners, and is experiencing a severe funding shortfall. They are struggling to pay teachers and hire extra farm labourers to help work all of the land on the farm. 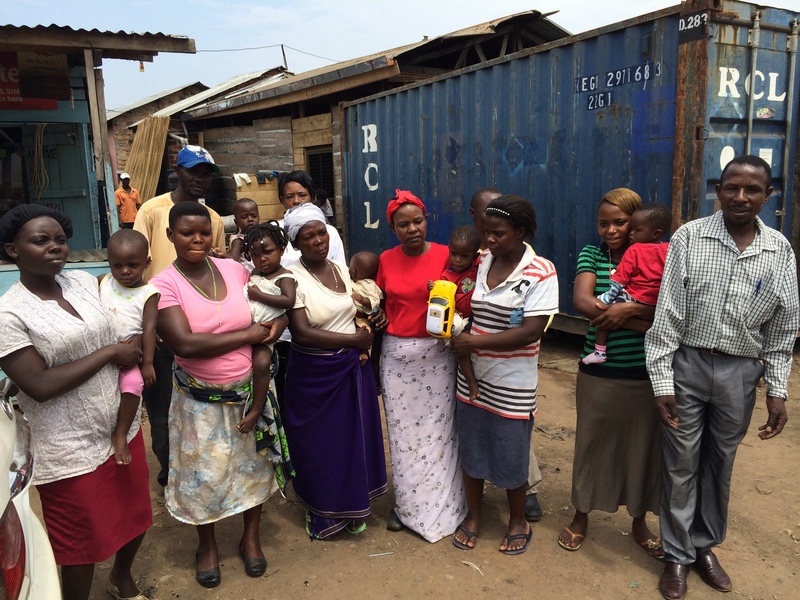 They have no electricity on site due to the high cost of installation, and are reliant on solar lamps at night. They also desperately need English, Art and Music teachers. If you would like to support the work of Vumilia and make a big impact in this small corner of rural Kenya, there are lots of things which you can do to help. I have been in Kenya for a little more than a week, and I really feel like I am learning a fantastic amount about the country, culture, people and the way development work is going here. It is evident that many communities are working hard to find solutions to their problems and improve their lives. Often they just need a little help or a few connections making with other organisations to really get their projects off the ground. It is giving me lots of ideas and thoughts about my future career, and is proving to be an amazing experience. We have visited quite a few projects thanks to our local partners. One of them helped a community build a bio gas producing toilet so that people can use the clean toilets instead of open sewers on the street. The toilets are used to produce biogas which will soon power a school’s kitchens, and the floor above the toilets is a community centre room shared by many groups working to improve local life, like health workers, women’s groups, savings groups. 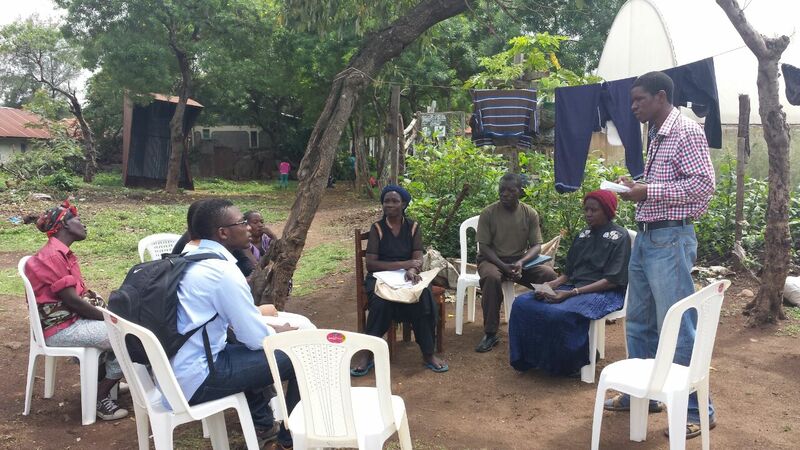 We also visited a community garden set up by a committee of women health workers. Many local children were malnourished so they created a garden to grow nutritious foods, and also a place where they could show mothers how to grow crops to feed their children. There’s also a great social business that produces flour using a variety of nutritious grains. It sells the flour to supermarkets, but also cheaply to poor local communities. They pay local farmers to grow the grains, which generates an income for them, and use waste grains to produce cheap chicken feed which they sell to local farmers. They have their own chicken farm, from which they sell the eggs and chicken manure to local farmers to help grow their crops organically. Since we got here, we have stayed with schools and orphanages, visited a health centre and had meetings with several entrepreneurs. Our days can be long and tiring, logistics are difficult and problems crop up, but the amazing people and organisations we keep meeting astound me every day! We will be staying with a local family in Kisumu in the coming days and they actually have a real working shower which is a miracle, as I have been using buckets to shower since we got here! 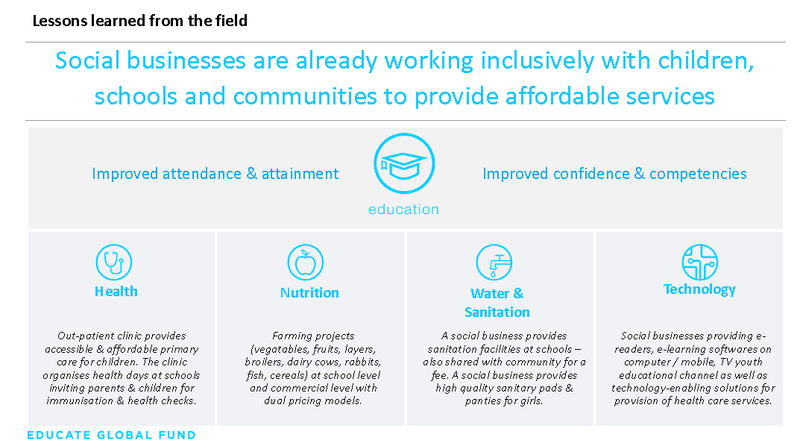 Impact Investing for Education – What is Education Poverty? In countries where less than 20% of children, for instance, complete secondary education, it is difficult to imagine how improved livelihoods, well-being & social progress can be sustained over time without educated citizens. Yet we have the opportunity, given underlying economics and economic resources, to bring millions out of poverty. 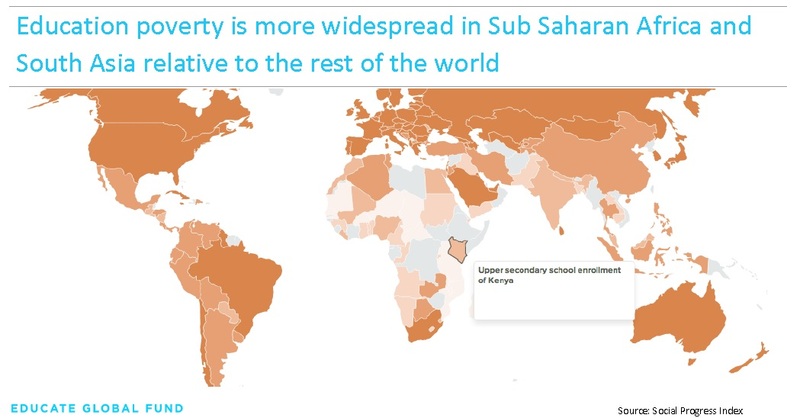 The map from the Social Progress Index here shows enrolment rates to upper secondary school – the lighter the colour the lowest the enrolment rate is within the country relative to the rest of the world. Read Social Progress Index 2014 Report here. 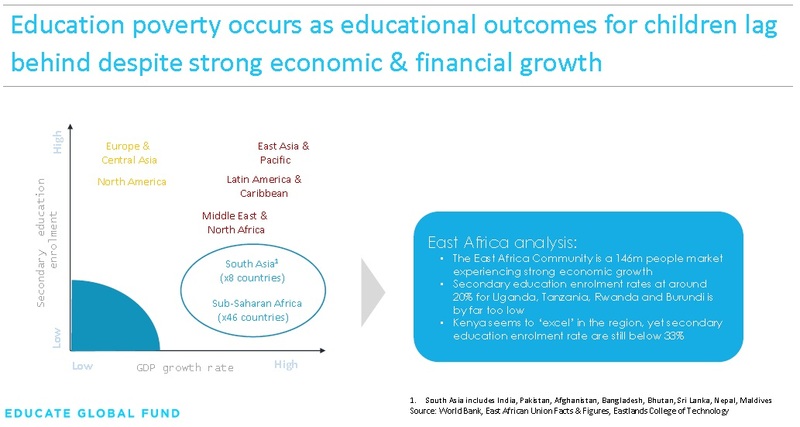 The East Africa Community is a 146m people market experiencing strong economic growth, yet secondary education enrolment rates are far too low at around 20% for Uganda, Tanzania, Rwanda and Burundi. Kenya seems to ‘excel’ in the region, yet secondary education enrolment rate at still below 33%. Whilst good progress has been made with regards to primary school enrolment (95%), only 33% of children in Kenya enrol into secondary education, and later only 4% enrol into tertiary vocational colleges or universities. Kenya’s population (under 18) counts 22m children & young people, and youth (15-34 year olds), who form 35% of the Kenyan population, have the highest unemployment rate of 67%. Every year over one million young people enter into the labour market without any skills or education. 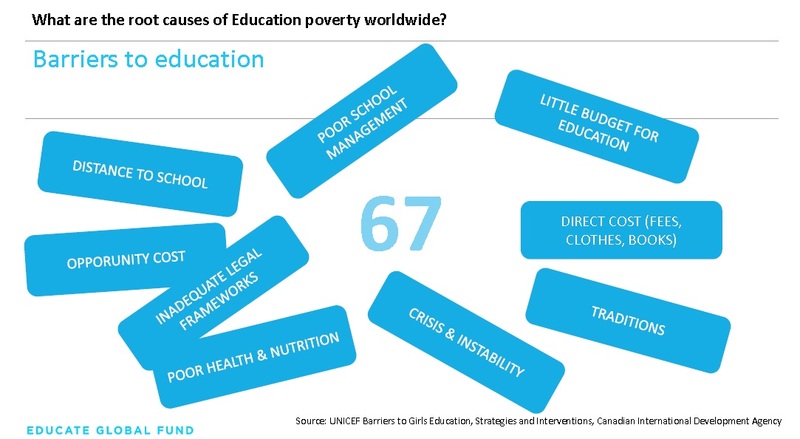 Education Poverty can be considered one of those “Wicked Problems”: large, messy, social, systematic issues which will remain with us, yet so much can be done to alleviate some of its pains (source: Partners4Change). It requires collaboration with all actors at different levels to tackle Education Poverty. As we make preparations to launch an impact investment fund dedicated to Education by 2015, EGF pledges its commitment to sharing, learning and growing with other organisations who share the same values. I arrived in Kampala, the capital and the largest city in Uganda, after a long journey, which included a 15-hour flight from London to Nairobi with a stopover in Istanbul, a connecting flight from Nairobi to Entebbe, a major town in central Uganda, and finally a drive from Entebbe to Kampala. 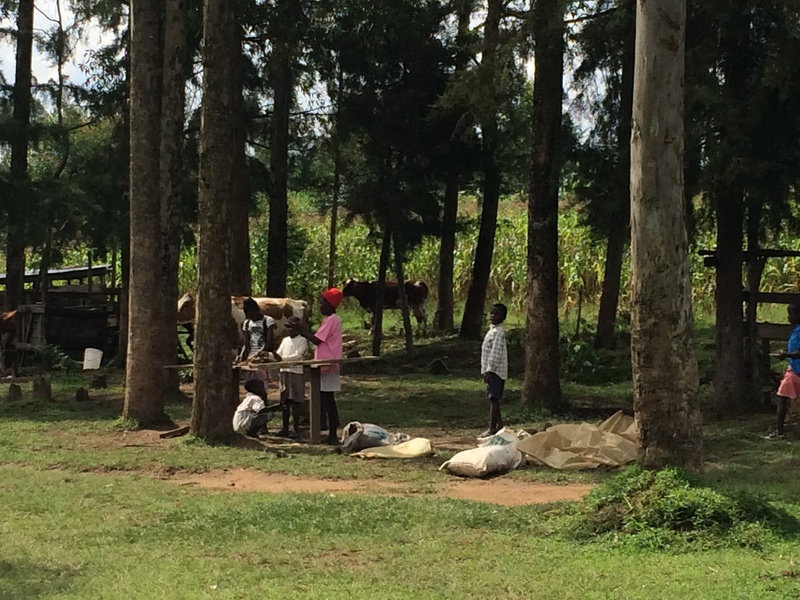 This is my first visit to Uganda, a green lush country that is hugely fertile with many delicious fruits and vegetables. I am also impressed by the construction work in the different hills of Kampala to build more residential & letting units for the community. I first visited Ka Tutandike, a community-based organization founded in 2006 to empower vulnerable communities in Uganda, where my host Susan explained the various projects of her organisation: from supporting mothers who work at the markets to launching a honey-retail business run by women with disabilities. I visited three markets — Ggaba, Natele and Mukono and saw first-hand how the local community has been mobilised to improve the lives of children whose mothers work as market vendors. Women who work in markets are often unmarried or single mothers. They sell fruits, vegetables and fish during the day and often engage in prostitution in the evening to compensate for a lack of income. The market is also where the mothers and their children sleep during the night when stalls are converted to shelters. Water-borne diseases and HIV/AIDs are rampant in the communities and children from the markets were (still are) prime targets for being abducted and indoctrinated during conflicts & wars by groups with an extreme political, ethnic or religious agenda. There are around 2,000 markets across Kampala and it is not unusual to find on average of 200 children aged between 6 months to 5 years old per market based on rough estimate. This means approximately at least 400,000 children at risk who are living in the markets of Kampala without access to day-care centres (pre-primary school). The future of children who live in the market is to become a market vendor/trader. Many do not attend primary schools or drop out of the education system. Older siblings usually take care of younger children, hence cannot attend school. The government has now put a ban on children being allowed in the markets without any supporting infrastructure, but many women vendors don’t have other choices. 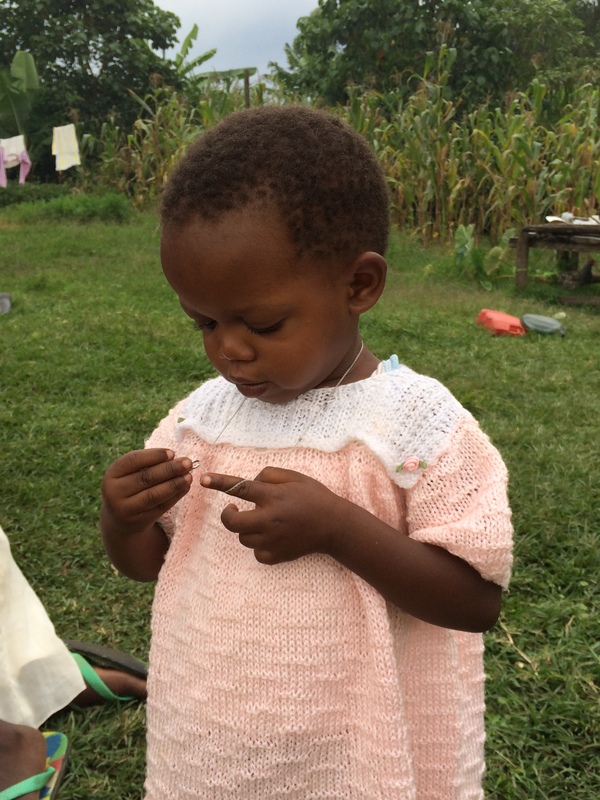 Early childhood centres in Uganda are all private for-profit organisations, and the government does not support the cost of early childhood care for the most disadvantaged. Yet, the women of Ggaba gathered to build and erect a day care centre through their own means whilst the market leader agreed to provide the land free of charge for the construction of the Early Childhood Development (ECD) centre – now accommodating 40 children. Ka-Tutandike then provides care training, access to health providers, a nutrition programme for 3 meals / day for children, beds and toys. It’s amazing to see our women and community leaders taking action, and as a result gaining confidence & pride to be able to care for children by themselves. A steering committee composed of mothers, the market leader, police child protection unit and town council social services are all engaged to give our children a better chance to fulfil their dreams from an early age. The team is also experimenting with a few different ideas to make this initiative scalable to 200 children living in the Ggaba market and financially sustainable in the future. 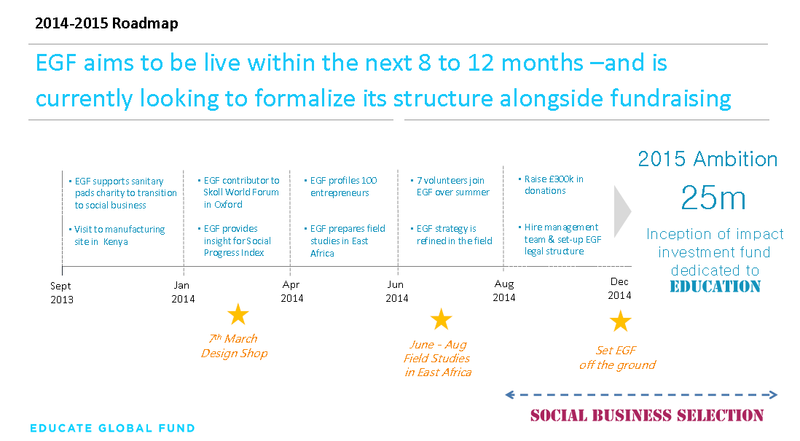 Impact Investing for Education – What are the next steps for EGF? 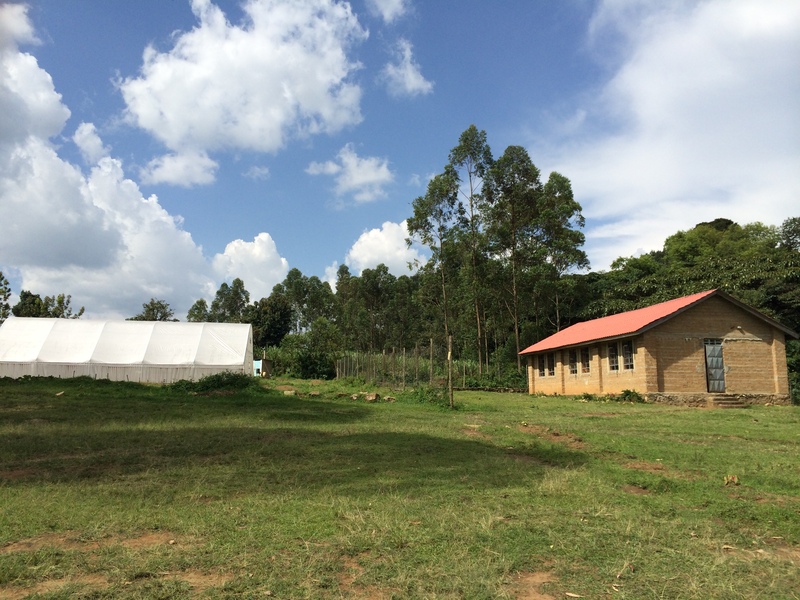 Shelter is a children’s home located just outside of the Ngong Hills 40km from Nairobi. 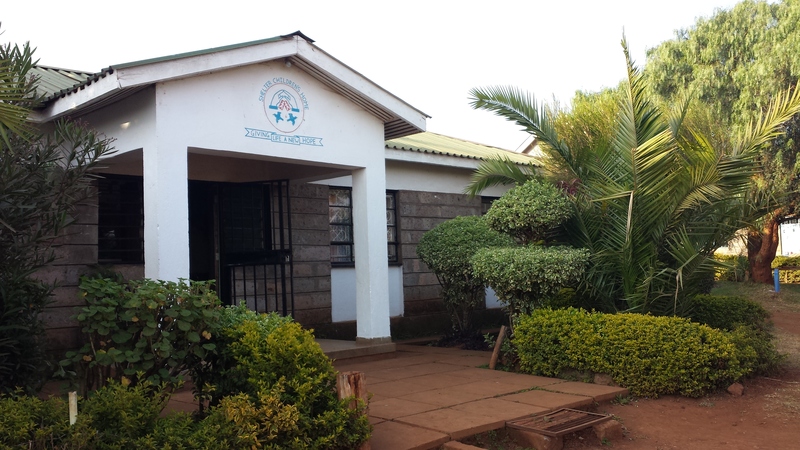 The orphanage is home to 190 boys and girls from the ages of 2-23 years old, most of them orphaned through HIV/AIDS. Shelter offers these children a loving home, nutritious diet and a good education. The children, staff and volunteers consider themselves part of a big family, giving the home has a warm community feeling. Situated on a large, secure plot with dormitories, a school, farm, kitchens, a playground and communal meeting place, Shelter feels not unlike a small village. Children are fully involved in community life – assisting with cooking, cleaning, farming and caring for one another. This gives them a sense of ownership and helps them to develop important practical skills. Shelter also welcomes visiting foreign volunteers, who assist with teaching, improvement of the facilities, and organise fun social events for the children. Shelter aims to empower its children through education to help them overcome their past and realise a bright future. The organisation is privately run and receives little government funding, reliant on the support of a few international funders and individuals. If you would like to support Shelter with a donation or visit as a volunteer, contact info@educateglobalfund.com . The EGF team was privileged to be welcomed into the Shelter family for a 6 night stay during their time in Nairobi. We enjoyed spending time with the children and getting to know them. We especially loved singing songs and toasting marshmallows round the campfire, joining them at church on Sunday, and getting a tour of the farm. 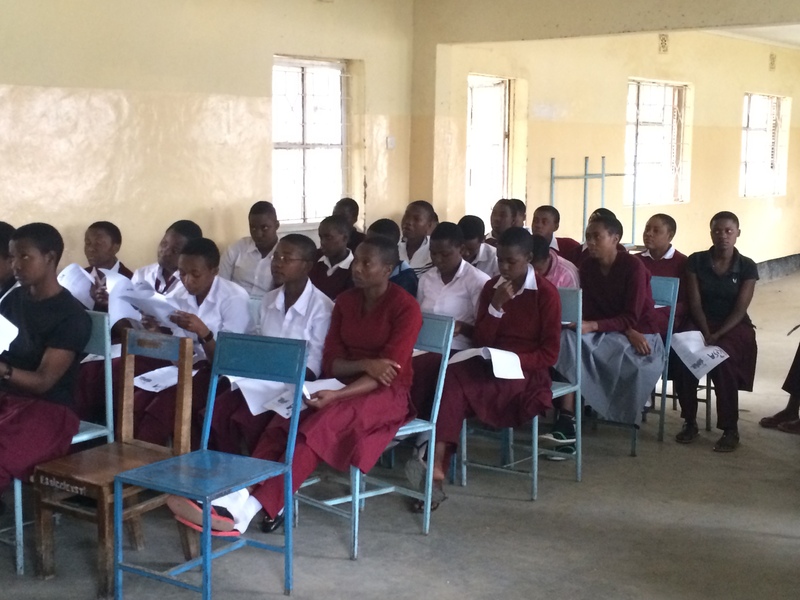 Shelter also took part in the EGF roundtable in Nairobi, bringing high school students who participated in discussions and activities relating to Education Poverty. Their dance troupe closed the event with a brilliant performance. Impact Investing for Education – What is a social business for Education? EGF’s mission is to overcome barriers to quality education by providing capital and strategic support to social businesses whose products and services are of commercial value whilst being accessible and affordable to the most disadvantaged communities. Our philosophy is that EGF ultimately seeks to provide opportunities for children to become educated citizens where core values such as empathy, compassion, respect, confidence are also being reinforced with life-skills such as financial literacy, business & entrepreneurship training from an early-age. We look for companies developing high quality affordable products & services locally where communities will lead the process of removing barriers to education themselves and ensure their own financial independence. We celebrate diversity in entrepreneurial approaches that impact attendance & attainment but also confidence & life-skills building at school.